This is a game based on the web comic ＨＯＭＥＳＴＵＣＫ. 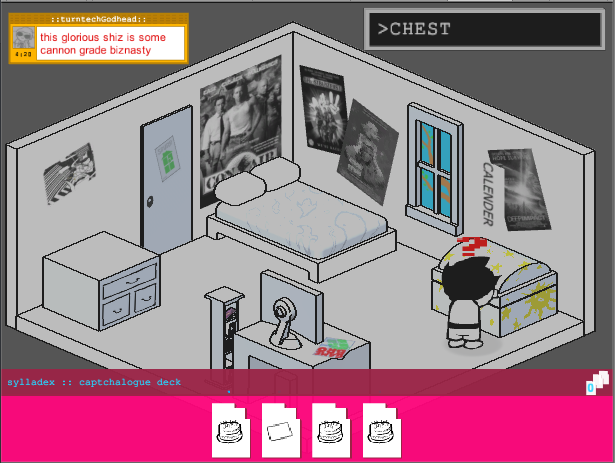 Homestuck was created by Andrew Hussie and is owned by (probably Andrew Hussie or WhatPumpkin). This game began as an experiment in just how 3D a 2D aesthetic can go and still retain its initial feeling and visual style. Homestuck being a comic based off of concepts and moon logic of old LucasArts Adventure games seemed like an interesting choice. Documentation of code and assets over the time of my work on this will be released publicly at a later date. This was created by me Gwen Valentine/AM.